Finished in Windsor Cherry on select hardwoods and veneers. 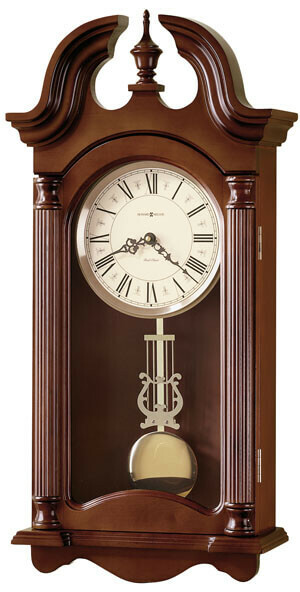 This wall clock offers a classic look with its swan neck pediment, turned finial, and reeded columns with turned column caps. The off-white dial showcases black Roman numerals and a raised polished brass-finished outer edge. Polished brass-finish continues within the case with a polished brass-finished pendulum and lyre. Quartz, battery-operated, triple-chime Harmonic movement plays choice of full Westminster or Ave Maria chimes with strike on the hour with 1/4, 1/2, and 3/4 chimes accordingly; Westminster chime and strike on the hour only; or Bim Bam chime on the hour only. Requires two C sized batteries (not included). You will save $145.20 (30 %) on this Howard Miller Everett 625-253.